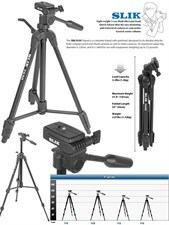 The SLIK F630 tripod is second entry in a new F series of economical, lightweight tripods for the casual photographer or videographer. Capable of holding lightweight digital SLR camera and video cameras the F630 has a smooth moving 3-way pan head that gives as good performance when recording video as it does holding the a camera for still shots. 3-way pan head with long panhandle for sure camera control. Rack and pinion geared center column with handle for controlled elevation of the camera.